Synopsis: Christine has amnesia. Every morning when she wakes up, she can remember none of her recent life.She has lost nearly twenty years of her life. Every day, her husband, Ben, tells her what has happened to her. When her doctor suggests that she start to keep a journal, she soon discovers that things are not what they seem. 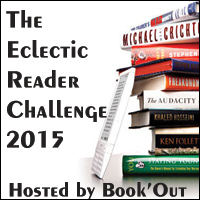 Reading Challenge: Eclectic Reader Challenge 2015 – Genre epistolary. I saw the film of this last year and I really enjoyed it so I assumed that I would also like the book. I was wrong. The film was taut and thrilling and for some reason it was easier to suspend my disbelief. However, the book just made me feel annoyed and by the end I couldn’t stop thinking about how many unlikely things had to happen for the outcome Watson gives us. Like other books I have read that have narrative quirks – The Time Traveller’s Wife, for example – I find that they quickly wear thin and rub me up the wrong way. 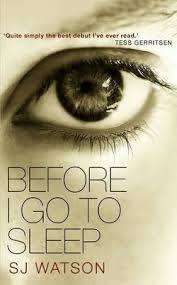 With Before I Go To Sleep, I kept imagining how long it would take Christine to re-read her ever-lengthening journal everyday. And then in the evening she had to find new ways to hide her writing from Ben. It quickly became repetitive. Christine herself was annoying. In the film, Nicole Kidman was utterly convincing and also quite sympathetic. Christine in the book was a bit pathetic and her narrative voice spent a long time running round in circles which was also annoying. While it is understandable that she might not trust her memories – especially as her doctor tells her that amnesiacs often fill the gaps with fiction – but after a few times when she doubts everything, I was bored. Having seen the film, I knew what the twist was and it was entertaining to look for clues about Ben’s real identity. (Actually, this may be responsible for my lack of patience with the narrative. Perhaps I expected her to notice more.) As the ending drew nearer, I hoped for the feelings of suspense that I felt in the film. And it was quite tense when Ben was driving her to the hotel as it is starting to become apparent even to someone who had not seen the film, that all was not what it seemed. However, there is another hiatus when Christine finds the pages that Ben has ripped out of her journal and I just couldn’t believe that she would have time to read them before he reappeared. Then it was all reliant on Claire, Christine’s friend, who somehow works out where they are and saves the day. Mike is helpfully killed and Ben and Adam reappear. Very neat and tidy. Of course, Christine still doesn’t know if she will remember what has happened but there are hints that she will as Doctor Nash informs her that they found no physical reason for her amnesia. I’m sure it would have been annoying if she had miraculously got her memory back. Nevertheless, this was an unsatisfactory ending and made me feel that the whole book had been a bit pointless. Overall, a disappointing read.